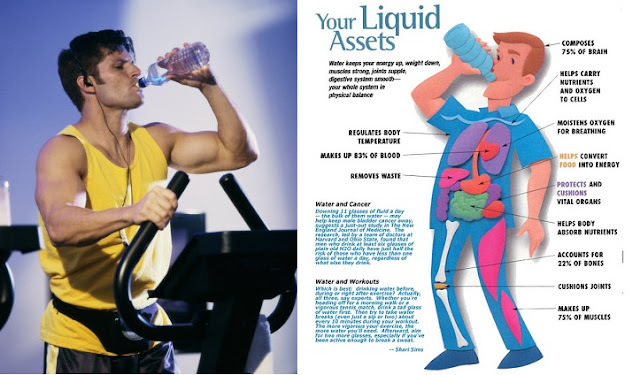 When we exercise, our body loses a very large amount of water. To be exact, our bodies can often lose up to a quart of water upon a sweaty workout routine. Talk about being thirsty, right? If we get to the point of thirst during exercise, then we have already gone way too far. Our body will definitely send us a signal when it is thirsty, but how can we know exactly how much to give it before it is too late and when? The answer is simple, the required daily amount of water intake can vary from one person to the next. This is how it works: You will take the amount in pounds of what you weigh right now, and divide that number by two. Whatever the outcome is the amount that you need to drink on a daily basis. Say for instance, you weigh 200 pounds; your required daily amount of water in ounces comes up to be 100 ounces of water a day. This is about 8 or 9 regular size water bottles. This is only the required amount and without exercise as well, however. The next thing you need to know is when you should drink your water. Typically, on a regular day, you should be drinking water throughout the day. If you are planning an exercise routine for that day, then you should drink a full bottle directly before, and 1 additional cup for every 15 minutes you are at the gym. Staying hydrated after your workouts is also very important. Be sure to replenish yourself with another bottle of water directly after your workouts in order to regulate your body temperature back to normal. All of that water intake may seem like too much, and it is probably a lot further away from the amount that you are consuming right now on a daily basis. Do not panic because you are still alive and it is not too late to make up for lost fluid. First thing is first, start with your unique daily amount. Keeping up with your daily water intake can be confusing at times, but it can also be made a lot easier. To keep things less confusing, try to think as time spent working out and time away from working out as two separate times so that you can be definite that you are indeed getting your requirement. Water helps people to avoid dehydration. Dehydration can cause muscle cramps, poor athletic performance, blurred thinking, and even death. It is true that we need a lot more water than we would think on a daily basis, but dehydration is nothing to play with. The more you sweat when you are working out, the more your temperature is rising, and the more water you are losing. Doesn’t it pay off in the end to stay hydrated when you are exercising? Did you know that if your body is lacking in water, that is slows down your metabolism? That is correct. Drinking the required daily amount of water can speed your metabolism up to unbelievable amounts. Water works so well for speeding up metabolism that people usually wind up burning an extra 460 calories per day. The reason for this is because ice cold water cools the body temperature down, so the body has to work extra hard to warm back up, therefore causing the metabolism boost. I give this out as a tip to clients in our Weight Loss group. Remember, calories add up to pounds. When your body is lacking in water, it can become very unhealthy and unable to work properly. Some of the problems that can occur from dehydration are: Dark yellow urine that smells very bad, kidney stones, weight gain, build up of toxins, migraines, constipation, heat stroke, and death. People really do not seem to take this matter seriously enough. Water should be considered a top priority in every single person’s lifestyle. A piece of interesting information that you might like to is that you can tell that you have drunk enough water once your urine is clear. So remember to drink 1 cup of water for every 15 minutes you are at the gym and to stay well hydrated before and after workouts. The health benefits of water are endless, and the importance of drinking water during your workouts is crucial. All in all, you will burn more fat, have a faster metabolism, be able to rid your body of unnecessary toxins, be healthier, and most of all stay hydrated. Water and proper hydration is important for people seeking weight loss. Like I tell my Weight Loss group, fitness is a healthy addiction, once you have adopted the habit, your body will not fail you.